Go to original pattern for design DROPS 182-13. Knitted shorts with rib, worked top down. Sizes S - XXXL. The piece is worked in DROPS Flora. 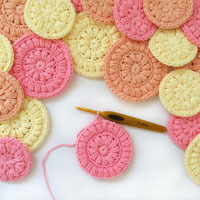 DROPS CIRCULAR NEEDLE (40 and 60 cm / 16'' and 24'') SIZE 3 mm/US 2.5 – or the size needed to get 24 stitches and 32 rows stockinette stitch on 10 cm / 4'' in width and 10 cm / 4'' in height. DROPS CIRCULAR NEEDLE (40 and 60 cm / 16'' and 24'') SIZE 2.5 mm/ US 1.5 for rib - or the size needed to get 26 stitches and 34 rows stockinette stitch on 10 cm / 4'' in width and 10 cm / 4'' in height. 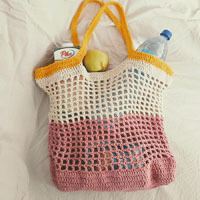 You can get the yarn to make this pattern from	11.70$. Read more. Increase 1 stitch on each side of each marker as follows: Work until there is 1 stitch left before the marker, make 1 yarn over, knit 2 (the marker sits in the middle of these 2 stitches), make 1 yarn over. 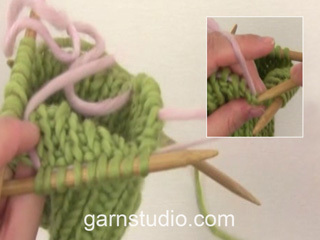 On the next round knit the yarn overs twisted (i.e. 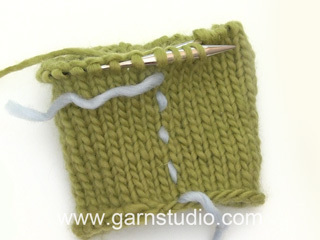 in the back loop of the stitch instead of the front) to avoid holes. The piece is worked in the round with circular needle, top down. Cast on 168-192-216-240 stitches with circular needle size 2.5 mm / US 1.5 and Flora. Insert 1 marker at the beginning of the round (= mid back) and 1 marker after 84-96-108-120 stitches (= mid front). 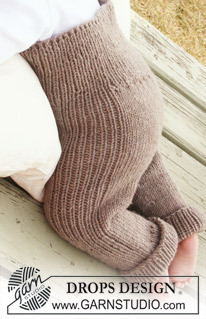 Sizes XS/S and L/XL: Purl 1, * knit 2, purl 2 *, repeat from *-* until there are 3 stitches left, finish with knit 2 and purl 1. 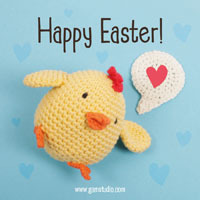 Sizes M and XXL/XXXL: Knit 1, * purl 2, knit 2 *, repeat from *-* until there are 3 stitches left, finish with purl 2, knit 1. When the piece measures 5 cm / 2'', work an elevation at the back as follows: Work 11 stitches rib, turn, tighten strand, work 22 stitches rib back, turn, tighten strand, work 32 stitches rib. Continue in this way by working 10 more stitches each time you turn until you have worked over a total of 122-122-142-142 stitches. Turn one last time to be on the right side of the piece. Work to the marker mid back = beginning of the round. Continue in the round with rib until the piece measures 20-22-24-26 cm / 8"-8 3/4"-9½"-10 1/4''. Change to circular needle size 3 mm / US 2.5 and work as follows: 27-33-39-45 stitches stockinette stitch, 30 stitches rib as before, 54-66-78-90 stitches stockinette stitch, 30 stitches rib as before and 27-33-39-45 stitches stockinette stitch. When the piece measures 24-26-28-30 cm / 9½"-10 1/4"-11"-11 3/4'' mid front, increase 2 stitches front and back – READ INCREASE TIP. Repeat the increases every 4th round a total of 10 times – the increased stitches are worked in stockinette stitch = 208-232-256-280 stitches. REMEMBER THE GAUGE! 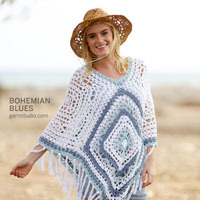 When the piece measures 35-37-39-41 cm / 13 3/4"-14½"-15 1/4"-16'' mid front, bind off the first 8-8-10-10 stitches after the marker mid back, work the next 88-100-108-120 stitches and then place them on 1 thread (= leg), work the next 16-16-20-20 stitches and leave them on the needle (= gusset), work the next 88-100-108-120 stitches and then place them on 1 thread (= leg), bind off the remaining 8-8-10-10 stitches, cut the strand. Then work 11-12-13-14 cm / 4½"-4 3/4"-5"-5½'' stockinette stitch back and forth over the 16-16-20-20 stitches on the needle, bind off and sew the gusset to the 16-16-20-20 stitches which were bind off mid back. Place the 88-100-108-120 stitches from the thread in the right side on short circular needle size 3 mm / US 2.5, in addition knit up 24-28-32-32 stitches along the one side of the gusset = 112-128-140-152 stitches. 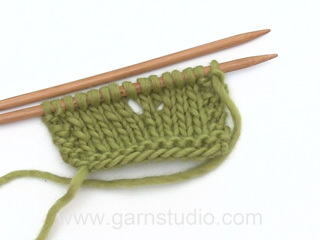 Continue by working rib over 30 stitches in the side as before, the other stitches are worked in stockinette stitch. Work as this until leg measures 3 cm / 1''. 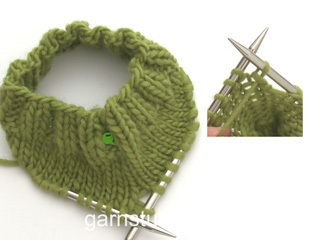 Change to short circular needle size 2.5 mm / US 1.5 and work rib, knit 2 / purl 2 over all stitches, make sure the rib is worked as before over the 30 stitches in the side. Work rib for 6 cm / 2 3/8'', bind off with knit over knit and purl over purl. Place the stitches from the other thread back on the needle and work as for the first leg. Der mangler nogle mål på opskriften, hvordan kan jeg vide hvilken størrelse jeg skal strikke?? Hej Mia, vælg den størrelse du normalt bruger, ribben gør at bukserne nok skal sidde pænt. God fornøjelse! Jag har kommit fram till att öka 10 maskor men vart ska dom sitta? Hej Pia, menar du de 2 maskor som skall ökas både fram och bak totalt 10 ggr ? I så fall gör du såhär: ÖKNINGSTIPS: Det ökas 1 maska på varje sida av varje markör så här: Sticka tills det återstår 1 maska före markören, gör 1 omslag, sticka 2 rätmaskor (markören sitter mitt emellan dessa 2 maskorna), gör 1 omslag. På nästa varv stickas omslagen vridet räta (dvs i bakre maskbågen i stället för i främre) för att slippa hål. Lycka till! Liebe Kitty, gemessen wird an der vorderen Mitte. Der Hinweis dazu wird ergänzt. Bei den nachfolgenden Maßangaben ist er bereits enthalten. Weiterhin viel Spaß beim Stricken! Mitä senttimääriä nuo koot vastaavat? Ohjeesta ei löydy kirjainkokojen lisäksi mitään vihjeitä tähän. Valitettavasti tähän malliin ei löydy mittapiirrosta. Housujen joustinneule on kuitenkin hyvin venyvä, joten neulo tavallisesti käyttämäsi koon mukaan. Er den liten i størrelsen? Savner mål eller tegning. Hei Maria. Vi har dessverre ingen målskisse på denne modellen, men ditt ønske er formidlet videre til design avdelingen for fremtidige lignende modeller. I denne modellen er det både vrangbord opp, i sidene og nede, så den er svært tøyelig. Bruker du vanligvis str S, vil str S i dene modellen helt sikkert passe fint. God Fornøyelse! Hej! Undrar om jag ska mäta på framsidan eller den förhöjda bak när jag är färdig med resåren i midjan? Hej Elin, du skall mäta på framsidan. Lycka till! Hej, på mönstret står det att man ska sticka tills arbetet mäter 20 cm, men ska man då mäta fram eller bak? På alla efter följande mätningar står bak eller fram men inte första gången. Hjälp snabbt tack! Veja o gráfico do modelo (desenho da camisola). Tem as medidas em cm para todos os tamanhos.